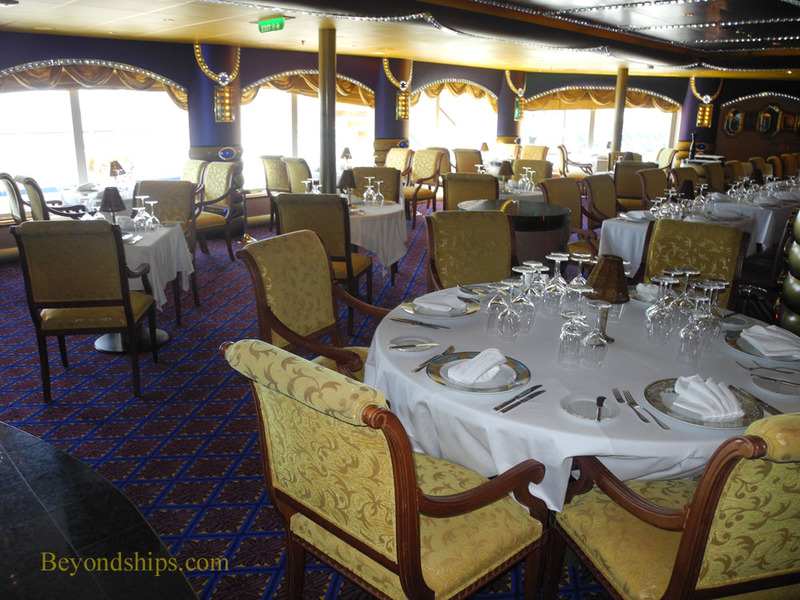 The Diamonds Steakhouse is the specialty restaurant on Carnival Liberty. A cruise ship specialty restaurant should offer more than a good meal. It should also offer a unique experience that is different than the ones offered elsewhere on the ship, one that is an independently memorable part of the guests' vacation. The Diamonds does this with quality food, excellent service and an ambiance that makes any evening seem like a special occasion. The restaurant is high atop the ship on Deck 10. It is a u-shaped room with large windows on both the port and starboard sides. The tables are in each of the legs of the room while an open kitchen, a small stage and a bar populate the connecting space. Overall, the room recalls the big city nightclubs of the first-half of the 20th century. The walls are dark blue with gold horizontal reliefs reminiscent of the Art Deco period decorating the counters of the open kitchen and the bar. Strings of tiny blue, white and amber lights embellish the walls like strings of jewels. After all, this is the Diamond Steakhouse. Adding to the glamorous 20th century atmosphere, playing in the background during dinner was a blend of Big Band and Rat Pack style music. The lights are kept low. Conversation is quiet. One drifts into a world apart from the rest of the ship. The guests dining in the Steakhouse recognized that this was a special evening. There was no formal wear but several guests wore jacket and tie or dresses. Indeed, at a nearby table a young boy and girl – the only children in the restaurant - - were dressed in their best outfits. The other guests wore elegant casual attire. A sommelier approached the table and offered intelligent suggestions as to the wine. His recommendation as to the La Crema pinot noir was exactly on the mark. He was followed by a waiter with a cart carrying various cuts of beef wrapped in plastic. The waiter explained each of the various cuts noting that the beef had been aged to Carnival's specifications. He remarked that the 18 ounce cowboy steak was quite popular and that it is cooked on the bone to enhance its flavor. The spice rubbed rib eye was marinated and was also 18 ounces. The king of any steakhouse is the filet mignon and while the descriptions of the other cuts sounded tempting, filet remains the cut of choice. At the Diamonds, you can have it in a surf and turf combination with a Maine lobster tail but the size of the filet is smaller. To begin the meal, the waiter brought an amuse bouche - - a surprise gift from the chef to get the taste buds working. This was a small portion of baked shrimp with tomato preserves. Quite nice. The steakhouse offers a selection of appetizers, soups and salads to enjoy while the main course is being prepared. In general, these are familiar but upscale items such as escargot, crab cake, shrimp cocktail and baked onion soup. The lobster bisque has vintage cognac and is a flavorful, thick soup that is presented with a flourish. It is poured at the table over a lobster salad. Not only is this good theater but pouring the soup at the table also ensues that the lobster salad remains fresh when it is consumed. We found the spinach salad to be a delightful surprise. Underneath the leaves of baby spinach was a tasty mushroom puree providing a sweet taste. This contrasted well with the rugged flavor of the pieces of blue cheese and bits of bacon sprinkled on top of the spinach. The main course was presented beautifully. The beef arrived perched on a bed of lightly grilled onion and wearing an edible crown. Surrounding it the chef had drizzled a circle of dots. It made a splendid design. The beef itself was extremely tender and flavorful. Ordered medium, it was close to that category's border with medium rare. However, to have cooked it further would have rendered the outer portion of this thick cut overdone. Guests can order three different sauces to accompany their beef - - Bearnaise, wiki mushroom and three peppercorn sauce. While we normally prefer peppercorn sauce, the mushroom sauce here was clearly the star, bringing out the flavor of the beef while at the same time adding a flavor of its own. The steakhouse also offers several side dishes to accompany the main course including baked potato, creamed spinach and steamed brocolli. However, the Yukon Gold mashed potatoes with wasabe horseradish still maintains its reputation as the best of the sides offered in the Carnival steakhouses. After such a large meal, the dessert has to be flavorful to be remembered. While the steakhouse offers a variety of desserts, we were most impressed by one of the simplest - - ice cream. This is not a scoop of supermarket vanilla but rather specialty flavors made onboard. The flavors change each night but on this night the flavors were almond and butterscotch ice creams and Bailey's lime sorbet. The ice creams were creamy and the sorbet actually tasted like the famous Irish liqueur. Throughout the meal, the service was pleasant and attentive making one feel special. Looking around the room, the guests appeared happy. Indeed, one couple came up to our table to say how much they had enjoyed the experience. Thus, the Diamonds Steakhouse satisfies both the missions of a specialty restaurant - - it offers a superior meal and a memorable experience.